January is National Stalking Awareness Month, a time in which we call on our communities to learn more about stalking, name it when it happens, and stop it from occurring. Stalking is difficult to recognize, investigate, and prosecute and often occurs within the context of other forms of violence, such as sexual assault or intimate partner violence. Because awareness the first step toward preventing violence, we join efforts to raise awareness and educate the public about stalking and its relationship to other forms of violence. 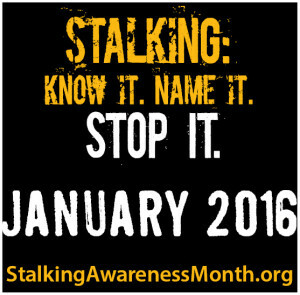 Throughout the month of January, PreventConnect will elevate this issue by using several tools developed by our partners at the Stalking Resource Center at the National Center for Victims of Crime. We encourage all of partners to engage in conversations on social media each day using the “31 Days of Social Media Messaging”, take time to educate yourself and your community about stalking, and share what you’re doing in your community this month to raise awareness about stalking!